Q. You couldn't have had a much better start than in the first three or four games. You hardly lost a point. RAFAEL NADAL: Yeah, I played well at the beginning with the right intensity, with no mistakes. So trying to do the right things to find a good feeling on the ball, to find the right rhythm. And I think I did, no? I played to the right places, and that gives me confidence. Start winning the match 3 0, 4 0, a lot of advantage, a lot of confidence. So very happy about the beginning. I didn't play my best game the first game of the second, and he played well, so he had the break. And after that he played well for a while the next games. Then he had a good chance, two breakpoints for the 3 Love. It was not an easy moment. I played one good point and I was able to be back. After that he had one important mistake with the 2 1 to have the break back, and that is very important for me. After that I think I played well with the right feelings and doing the right things. So very happy. Q. You always say here is very special for you. What makes it special? Q. Yes. Besides just winning. RAFAEL NADAL: You cannot say one thing, no? For me this tournament is tournament I saw on TV when I was a kid, so always I dreamt to be playing here one day. I had that dream converted in 2003. So after this year, 2004, I wasn't able to came here for the injury, and then I had the amazing success, something I could not imagine, no? This tournament is special. The place is very special, very beautiful. The tournament is history. All the best players of the history played here. These kind of tournaments are very special for everybody. For the tour, is very important to save this tournament, to maintain this tournament with very high status, because all the sports needs innovations, needs new, big events, but historic events like this one makes the tour important, makes the sport bigger. Q. Is it in a way more tiring, the idea that you have always to win when you come to a tournament like this because everyone is expecting you to win all the time on clay, or you don't really care that much? RAFAEL NADAL: That's what you say. That's not my feeling. So I don't feel that I have to win. I feel that I am coming here trying to play well. As in every tournament, try my best in every moment. If that happens, if I'm able to play my best tennis, probably I will have my chance to be in a good position to play in the last rounds, to fight for important things, no? But today just I won the second round, so that's very early to say nothing. Seriously after what happened the last year, you know what happened, I cannot come here and think that I have that pressure to win, less than ever. That's the real thing. I don't have that feeling. Every victory means a lot to me today. Q. You talked a little bit the other day about this almost being like starting again again. Were you nervous today? RAFAEL NADAL: No, not lot of nervous, not nothing. At the end I know what I have to do. I need every day that I practice, every day that I am competing the things comes little bit less difficult for me because I remember all the routines, all the way, the way that I have to play to play well here on clay and how I need to play to win the points. But I say before, no, just be here is fantastic new for me. For that reason probably I don't feel this extra pressure when I'm coming here that I felt sometimes, no? Is expectation you feel this tournament that you need to go in the final rounds, because if not you are going down in the ranking or you are fighting. I think is a different history this year for me, no? I'm in a position that every victory is very important to me, means a lot to me, and every day is a present to be on court. That's what I am looking now. That's today's vision after what happened the last year, no? So we'll see what's going on. Probably I will come back, hopefully I will come back to this extra pressure if things go well. But it's too early to think that everything is completely perfect, no? Q. After the French Open raising the prize money, do you feel like players are really heard now by organizations? Are you satisfied? Is there still work to do? RAFAEL NADAL: No, I think is great that the bigger tournament that we have on clay represent the surface. With this increase, being at the same level than the rest of the Grand Slams is great for the clay in general. You know, like European player, a player who loves clay, I think that's a fantastic new for the future of tennis, and to make the sport bigger. I think is great what Roland Garros is doing for the tennis. Q. You said at the start of the second set you weren't happy. Any reason your level went down? RAFAEL NADAL: No, I had a mistake with my forehand in the first point that I didn't have during all match. Then I think he played well. I think he played a few great points. I didn't serve well the first game of the second, and I give him the chance to attack. But after that, nothing to say. He played very well. He played very aggressive with a lot of winners. Well play for him. Q. You've been on the tour for 10 years. 10 years ago it seems there were more clay court players. 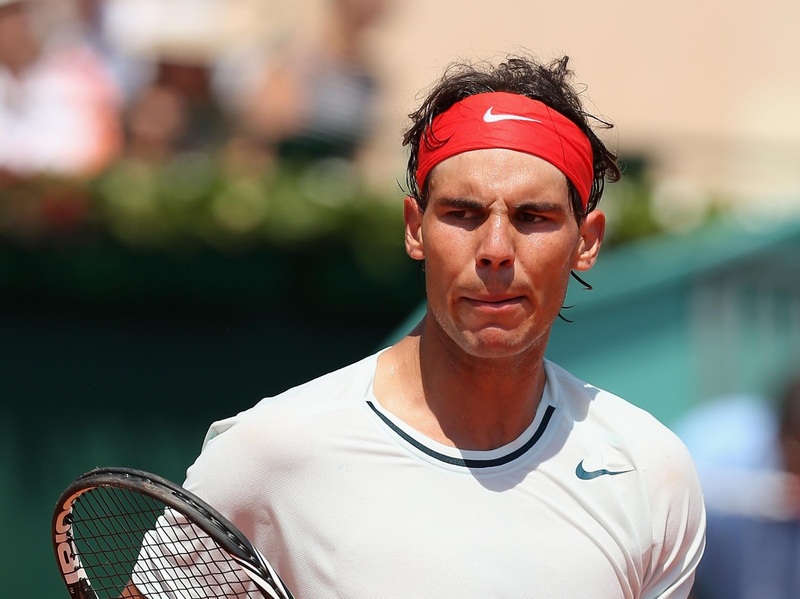 Do you think tennis on clay has changed in 10 years, and what has changed? RAFAEL NADAL: And if the tour continues this way, in 10 more years, going to be less clay court players. Is normal. If we reduce the tournaments on clay, the best players ranked are specialists on hard courts. That's normal. When you have more tournaments on hard courts, is more that the best players and the top ranked players are more specialists on hard than clay because the players prefer to play on the surface that going to play more. That's it. Q. What did you think when he knocked over your water bottles today? RAFAEL NADAL: Nothing (smiling). Something that I don't going to do to opponent. No, was not a pressure moment. Was a funny one. Certainly maybe he thought that affects my concentration. But that's just simply routine for me to be focused. The only thing I did was put the bottles another time on the same place. Q. You didn't want to go over and knock over his bottles? RAFAEL NADAL: No, I don't (smiling). Q. You said the other day you felt you did have enough recovery time from Indian Wells, that you'd be fine here. Do you think today is a good example that you were right? Your physical condition, you had plenty of time to relax. RAFAEL NADAL: No, what I said the other day is I want to play tennis, talk about tennis, don't talk any more about the knee because at the end I happy playing tennis. Talking more than unusual about the knee is not positive for me, is not positive for the opponents, for the tournament, for nobody, no? What happened happened. Hopefully the thing's going to go well. If the things are not going well, I let you know.